Travel safely with your dog, with the Air Cushion from All For Paws. The AFP Air Cushion is a car seat for dogs that can be attached to the front or back seat of almost any car. All For Paws specialise in designing unique, stylish products for cats and dogs. The team behind All For Paws strives to continually design products that meet the needs of pets, but also fit the lifestyles of their owners. They describe them as practical products with a story and purpose. 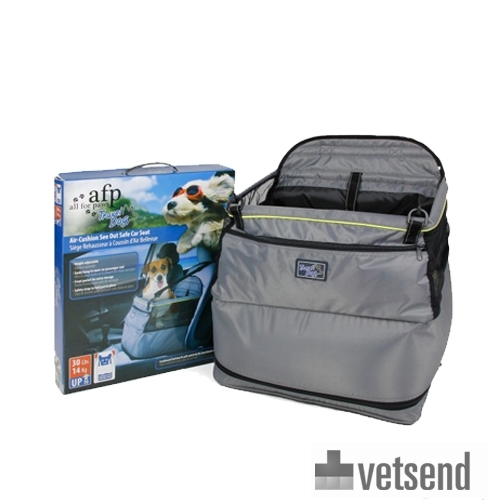 All For Paws products are available worldwide and, of course, here at Vetsend.co.uk. Travel safely with your dog, with the Air Cushion from All For Paws. The AFP Air Cushion is a car seat for dogs that can be attached to the front or back seat of almost any car. The dog can easily be fastened in, for safe travelling. Your dog sits high on an inflatable cushion so they can see out of the window. The cushion is very comfortable and has a front pocket for extra storage. When the AFP Air Cushion is not being used, it is easy to store away. Please note: The AFP Air Cushion is suitable for dogs that weigh up to 14 kg. Have you used AFP Air Cushion before? Let us know what you think about this product.